Remembering Bill Hagamen (November 4, 1924 – March 26, 2007) with links to our works about his work, and our unfinished joint work. For those who speak Russian, I gave a non-technical talk in Russian on April 19, 2012, on the birth of formal semantics from linguistics and philosophy. It's for non-specialists, in the polit.ru public lectures series. There was about an hour of questions and answers after the talk. "Формальная семантика как порождение лингвистики и философии"
Partee, Barbara H., Borschev, Vladimir, Paducheva, Elena V., Testelets, Yakov G., and Yanovich, Igor. In press. Genitive of negation, genitive of intensionality, and subjunctive in Russian. Journal of Language and Verbal Behavior - Jazyk i Rečevaja Dejatel'nost'. Partee, Barbara H. 2012. Remembering Aleksandr Evgenevich Kibrik. In Aleksandr Evgen'evich Kibrik. In Memoriam. Materialy nauchno-memorial'nyx chtenij pamjati A.E. Kibrika 9 dekabrja 2012 g., eds. V.I. Belikov et al., 104-105. Moscow: OTiPL, Philological Faculty, MGU imeni M.V.Lomonosova. Partee, Barbara H., Borschev, Vladimir, Paducheva, Elena V., Testelets, Yakov, and Yanovich, Igor. 2012. The Role of verb semantics in genitive alternations: Genitive of Negation and Genitive of Intensionality. In The Russian Verb. Oslo Studies in Language 4(1). eds. A. Gr�nn and A. Pazel'skaya. [PDF] (This version is a somewhat expanded version of Borschev et al (2011). Borschev, Vladimir, and Partee, Barbara H. 2011. Genitiv mery v russkom jazyke, tipy i sorta [The genitive of measure in Russian, Types and sorts]. In Slovo i jazyk. Sbornik statej k 80-letiju akademika Ju.D.Apresjana [Word and Language. A Collection of Articles for the 80th Birthday of Academician Ju.D. Apresjan], eds. I.M. Boguslavsky, L.L. Iomdin and L.P. Krysin, 95-137. Moscow: Jazyki slavjanskix kultur'. Video: April 2010, Riga: “Is This a Good Time for Formal Semantics?”: a video in the “Is This a Good Time?” series, put together by two young journalism scholars in Riga. You aren’t told what the question is until you come to the interview, then you have 5 minutes to think, and then the cameras start rolling! And there are no pauses or second takes – it is what it is. Video is here: http://vimeo.com/isthisagoodtime/barbarapartee or http://vimeo.com/20664367 . A number of my older papers have now been turned into PDF form and put onto the Semantics Archive. For specific links, see Research page. Partee, Barbara H. 2004. Compositionality in Formal Semantics: Selected Papers of Barbara Partee. Oxford: Blackwell Publishers. My research and teaching interests center on formal semantics and its connections with syntax, pragmatics, and logic, and on related issues in the philosophy of language and in cognitive science. One lifelong interest is quantification. An NSF-supported project with Emmon Bach and Angelika Kratzer dealt with cross-linguistic quantification and semantic typology. Another project in collaboration with Eva Hajicova and Petr Sgall of Charles University, Prague, concerned topic-focus structure and quantification, integrating the contemporary Prague school approach with work in formal semantics. 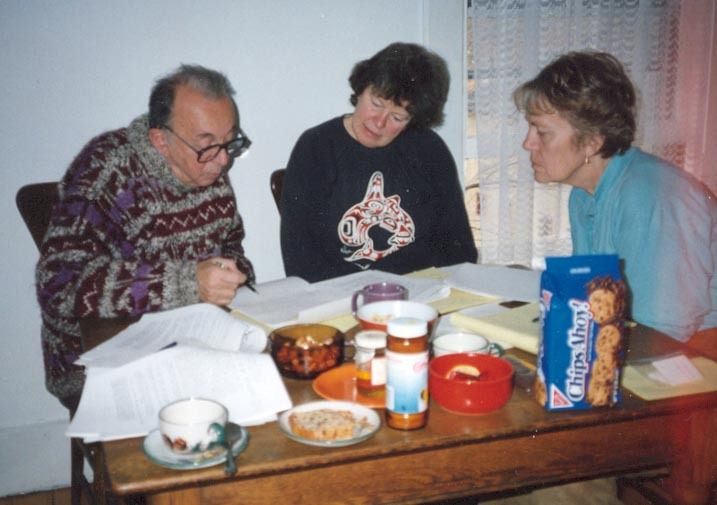 Photo: Sgall, Partee, and Hajicova at work in Amherst, with coffee, fall 1993. Photo taken by Christine Bartels. Other areas of recent and current research include the semantics of adjectives and prototype theory (with Hans Kamp), the interaction of noun phrase semantics with verbal aspect, the semantics of specificational pseudocleft sentences and the question of inversion around “be” in English , and joint work with Vladimir Borschev on the semantics of the “genitive of negation” in Russian existential sentences. The main focus of my recent and current research, joint with Borschev, is the integration of lexical semantics (especially including Moscow School lexical semantics) with formal semantics, including issues of type-shifting and of sortal structures and sort-shifting. Our first NSF grant (1999-2003) with Borschev and other Russian colleagues and with UMass graduate students concerned the semantics of genitive (possessive) constructions with relational and non-relational nouns in English and Russian, focusing on problems of the interaction of lexical semantics, compositional semantics, and context. Our most recent NSF grant (2004-08) focused on the semantics and distribution of the Russian genitive of negation and its relation to a range of issues including "perspectival structure", existential sentences, scope of negation, unaccusativity, and diathesis shift, semantic bleaching and other effects of the interaction of lexical and compositional semantics. 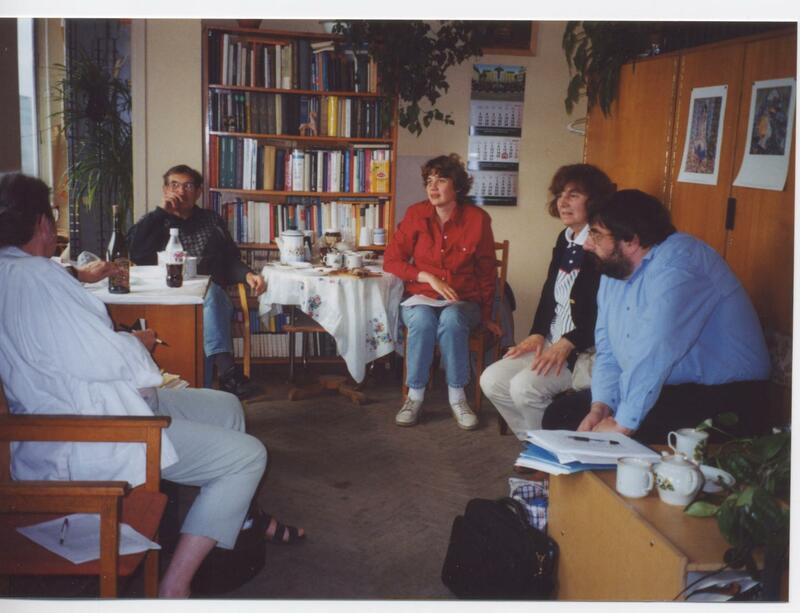 Photo: Partee, Borschev, Rakhilina, Paducheva, and Testelets at work, with tea, VINITI, Moscow, Summer 2002. Photo taken by Ji-yung Kim. A long-term interest relating to philosophy and cognitive science is the bridging of the apparent divide between ‘logical’ and ‘cognitive’ approaches to the foundations of semantics. Since 2010, a main current project is working on a book, The History of Formal Semantics, for Oxford University Press. It will take me a number of years. My work on it includes studying things I've found in the Montague archives in the UCLA Library, and also doing lots of interesting interviews. (The interviews won't be published as such; they just give me a lot of information and perspectives to add to my own.) As I work, I'm giving related talks and writing related articles -- see History section on the Research page. All of the teaching materials for my formal semantics courses in Moscow since 2003 are online on my Teaching page, as are a number of my UMass courses in mathematics for linguists (some of those taught jointly with Vladimir Borschev) and a few of my UMass semantics seminars. Computational Semantics: Compiled by Kyle Rawlins. Resources for Research on Genitives/Possessives and Beyond: Compiled by Ji-yung Kim for Barbara H. Partee. : An archive "for exchanging papers of interest to natural language semanticists". Semantics Web Resources: Compiled by Kai von Fintel. B.A. 1961 in Mathematics with High Honors, Swarthmore College. Minors in Russian and Philosophy. Ph.D. 1965, MIT, linguistics, minor in mathematics. Dissertation: Subject and Object in Modern English. Dissertation advisor: Noam Chomsky. Taught at UCLA 1965-1972, first Linguistics, then Linguistics and Philosophy. 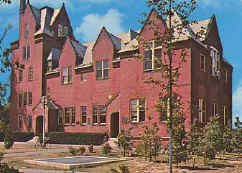 Joined UMass Amherst faculty in 1972. Professor since 1973, department head 1987-93. 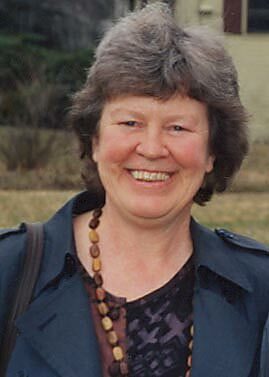 Emerita as of January 2004. Taught at 1966, 1974, 1987, 1989, and 1991 LSA Summer Institutes. Visiting Professorships at El Colegio de Mexico; Charles University, Prague; Moscow State University, Russian State Humanities University, Higher School of Economics, Moscow; University of Leipzig; University of Canterbury, Christchurch. 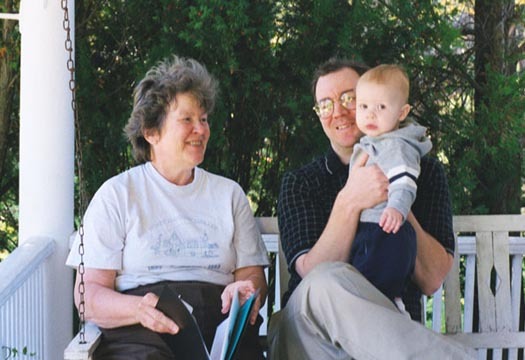 Board of Managers, Swarthmore College, 1990-2002. NSF grants, Co-P.I. or P.I., 1973-75, 1979-81, 1988-92, 1989-90, 1999-2003, 2004-08. Last revised November 2, 2013. Web page created by Barbara H. Partee, with help from John McCarthy, Paul de Lacy, Ji-Yung Kim, Florian Schwarz.